En Gedi is a site located on the western shore of the Dead Sea 23 mi. [37 km.] “as the crow flies” southwest of Jerusalem, 18 mi. [29 km.] east-southeast of Hebron and 10 mi. [6 km.] north of Masada. 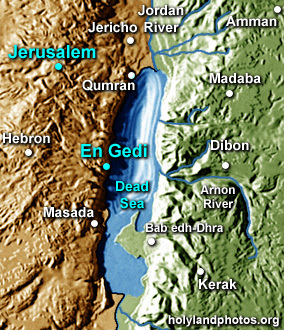 En Gedi is a desert oasis that was inhabited during the Chalcolithic Period, the Iron through the Byzantine Periods. It was allotted to the tribe of Judah (Joshua 15:62). Here David hid from Saul (1 Samuel 24), and here special spices were grown. It was also famous for its vineyards (Song of Songs 1:14).